Diesel generators can generate electrical energy throughout your home when you experience a power outage or need it for power tools or an air conditioning unit. They generally last longer, use less fuel and are louder and more expensive than gasoline fueled engines. Expect to pay more for a good one, as there start to be more units for residential use coming onto the market all the time. 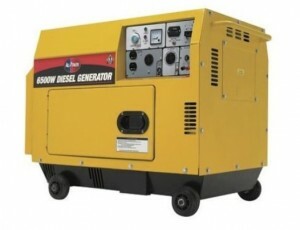 You can find the best diesel generator for the home online where there are a number rated by consumers who bought them. Here are some to consider. This All Power America APG 3202 Silent Diesel Powered Generator has an electrical starting system. It has a recoil backup starter. It has a 10 hp 4 stroke air cooled engine for added power. There is an hour meter that helps avoid overloading and determine when you need to perform maintenance. There are several outlets including two 120 volts, one 12 volt DC, and one 120/240 volt twist lock. It runs at 5000 watts continuous and 6500 watts surge. It comes with a wheel kit for easy mobility and it has handles. It can run up to 11 hours at half load and has a fuel capacity of four gallons. It runs quietly at 70 dba. It costs about $1700 online. It is non carb compliant and is not sold in the state of California. 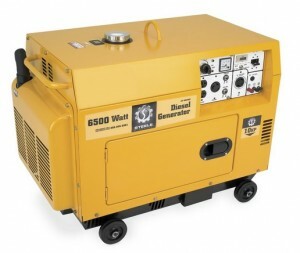 This Pro Series GENSD7 Diesel Generator runs at 5500 watts rated and 7000 watts peak. It has a 9 hp single phase 418cc two pole engine. It has several outlets including one 120/240 volt maximum output. It has a frequency of 60 Hz and it has a fuel capacity of four gallons. 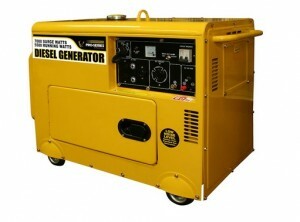 This item costs about $1500 online and it considered one of the best diesel generator for the home. It has an automatic oil shut down to help protect the life of the engine. It is non carb compliant and is not sold in the state of California. It is EPA approved and the item includes a battery. There is a self priming electrical starting system and a circuit protection along with a voltage meter. It can run for up to seven hours at full load and there is a fuel gauge to easily determine how much fuel is left. This Steele Products SPGD650E Diesel Powered Portable Generator has an electrical starting system and it earned 4 stars from Amazon reviewers making it one of the best diesel generator for the home. There is a 4 cycle 10 hp engine and it can run for up to 9.5 hours at half load. It runs quietly at 70 dB and it comes with handles and four wheels for easy mobility. There is a four gallon fuel capacity and it costs about $2255 online. It runs at 6500 watts starting and 5000 watts rated. It is non carb compliant and is not sold in the state of California. 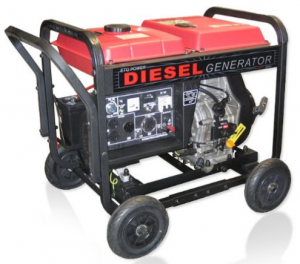 All of these diesel generators are ideal to have around your home as they offer multiple features and can generate enough power throughout your home for lighting, power tools, and an air conditioning unit. Analyze each unit to determine which one best fits your needs.